. : Farm Forest Line - Genetic composition of the forest :.  a preference for greater or lesser genetic diversity. Introducing new genetic material can irreversibly change the genetic composition of existing vegetation in the area. This can happen through hybridisaiton or interbreeding and can be very difficult to reverse in the future. Another consideration is that native genotypes lost from a site may be expensive or impossible to recover. So, farmers need to think carefully and strategically before making a decision about the genetic composition of a forest.  clonal stockproduced from grafting or budding root stock or stem or root cuttings.  the need to protect seed/stock from vermin. There is enormous genetic variability within almost every tree species. Forest farmers need to consider growth rates, frost resistance, branching habit, flowering times and wood characteristics. There are seed-lots (or provenances), improved seed varieties and clones available to provide the characteristics farmers are looking for in most instances. Because intensive tree breeding and clonal selection can be complex and expensive, some industrial forestry organizations are participating in cooperative breeding programs. These concentrate on improving particular traits in a limited range of species. Landowners may be able to benefit from this work if they are able to buy stock selected for criteria similar to, or compatible with, their needs. For example, a pulpwood company may select trees of high wood density, small branches and high growth rates. These characteristics may also be desirable for a grower interested in the same species for sawlog production. However, there is a risk that a breeding program will overlook important attributes that would make the improved seed less suited for some uses. For example, growth stresses, reaction wood or spiral grain may be overlooked in a breeding program focused on pulpwood production making the improved seed inappropriate for sawlog production. Tree breeding has improved growth and productivity across several forestry and horticultural species. Despite these improvements, farmers should be cautious about planting a forest with a very narrow genetic base. The extreme example is a clonal forest common in poplarswhere there is no genetic difference between the individual trees. The complexity of the interaction between the genetics and the environmentand the long time periods involved in forestrymean that maintaining a broad genetic base is often a sensible risk management strategy. Where particular selections of either species or varieties appear preferable, the farmer could choose to incorporate a number of the more promising into a mixed planting instead of choosing just one. Indigenous or native tree species are generally thought to be well adapted to the local soil and climatic environment. 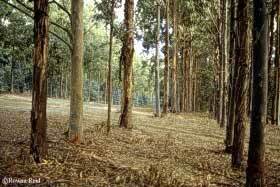 However, in most farming situations the current environment in which trees will grow may be very different to that of the original native forest. In many areas farming practices have resulted in significant changes in the soil properties due to pasture and crop management, fertiliser application, waterlogging and land degradation. There may also be different pests and diseases and greater exposure to winds and frosts than was the case prior to settlement of the area. Growers should keep records of seed or plant sources and their genetic origins. These will help identify the best performing genetic material for use in later plantings, and might also help in the marketing of tree products such as seed, cuttings or timber.